Since the decision on June 5th 2017 by Saudi Arabia, the United Arab Emirates, Bahrain and Egypt to bar Qatari registered aircraft from their airspace, there has – inevitably – been considerable impact on Qatari air traffic. With preliminary traffic data now available with OAG until October 2017 it’s possible to see what the size of the hit has been, and how Qatar is adapting. 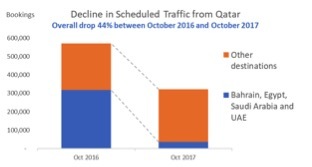 As of October 2017, scheduled traffic departing Qatar was down by 44%. While this is a massive reduction, there are two separate trends taking place. Just prior to the ban, in May 2017, traffic between Qatar and the four countries imposing the ban accounted for 55% of all Qatar traffic and was presumably made up of a mix of mostly business traffic, shopping and leisure travellers. Not surprisingly, that part of the traffic has fallen away dramatically and in October numbers were down by 89% on October the previous year. 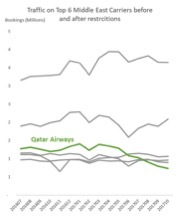 While there were still 35,000 bookings made for October from Qatar to these countries, 50% were via Kuwait, another 30% via Muscat and 10% via Amman. The other story is that traffic from Qatar to other destinations was 14% up on a year earlier in October. For a country with a population of 2.64 million, there are only about 313,000 Qatari nationals, or 12% of the population, and the rest are mostly foreign workers. About 1.8 million of those are from South and South East Asia with the largest resident populations coming from India (650,000), Nepal (>350,000), Bangladesh (280,000) and the Philippines (260,000). Qatar Airways has clearly redeployed capacity, if not to these countries specifically, then to other parts of South and South East Asia with December 2017 capacity to Thailand up by 30%, to Indonesia up by 17%, to Sri Lanka up by 24% and to the Philippines up by 16%. In order to facilitate connecting traffic flows via Kuwait and Oman, Qatar Airways has also increased capacity with seats to Kuwait up by 64% and seats to Oman up by 36% in December. A couple of other ‘winners’ in Qatar Airways forced reassessment of it’s network are Germany which sees capacity up by 24% and Turkey which benefitted from 48% more seats in December than a year earlier. While there is no sign of an end to the political isolation of Qatar by neighbouring States, there are at least some things that affected airlines can and are doing to alleviate the impact.